Music festivals have undergone something of a transformation in recent years. It's no longer about the young, wild and free. Now music loving parents can shake their leg at music festivals thanks to the rise of family based festivals such as Camp Bestival and Latitude. If Chris Martin can take his family along, why can't we? You can tell we are newbies to the music festival scene by our white trainers!! 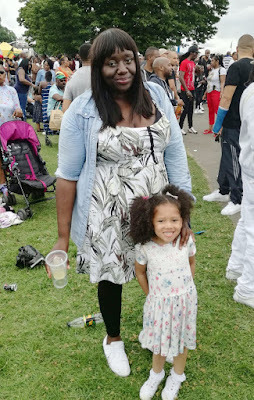 This year we have dipped our toes, with a few London-based family festivals, including not 1 but 2 days at Lambeth Country Show . I wasn't sure how Darcy would cope with all the excitement and hustle and bustle of a festival. It turns out my child is a right little raver and I had nothing to worry about. So I'm already planning on going to a festival with her next year, but I was unsure which one would be best for us. Luckily Travelodge has created a fun quiz to find out which family festival suits your family best, it only takes a few minutes to complete. Not only does it tell you which festivals are best for you, it also finds a Travelodge hotel which is nearest the festival site. You can check out the quiz here. Our results shows that our festival personality was ..... foodies, shock, horror!! 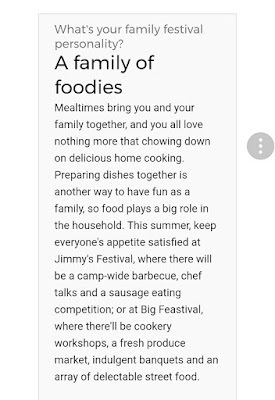 And matched us with Jimmy's Festival which unfortunately we have missed this year. We used Travelodge a lot, not only are they great value for money. Their family rooms are spacious, they come with the most comfortable king size bed, two pull out beds and their all you can eat breakfast is free for kids. We are actually heading off to Bournemouth this week for a few days, fingers crossed the weather is good so we can paddle our feet in the sea. 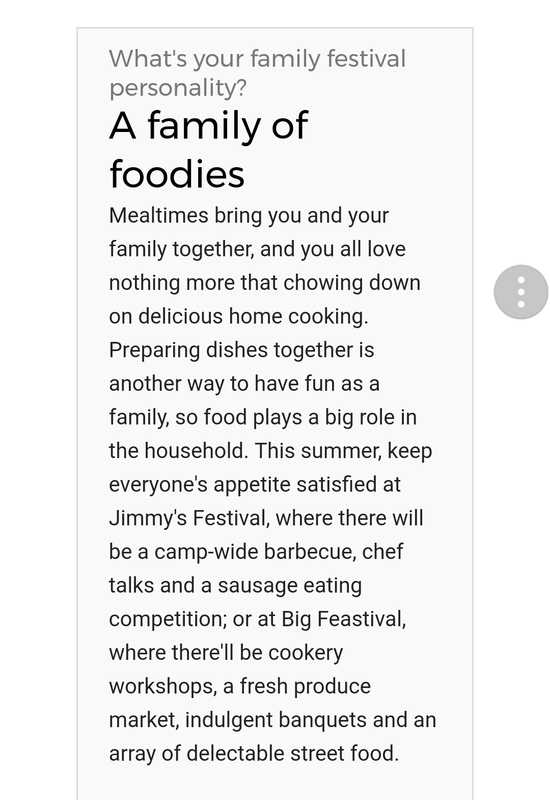 So have you taken the #FamilyFestQuiz yet? which festival personality is your family?